Costa Rica is a beautiful Central American country. It is known for stunning landscapes, beautiful animal habitats and tons of tourism. One thing that many people don't know about Costa Rica is that the country also provides excellent dental care, and citizens of the country -- and tourists from across the world -- go there for dental work. People that are interested in learning more about dentistry in Costa Rica may find the following information helpful. Today, Costa Rica is a country that provides advanced dental care. They use some of the newest technologies and materials for treatments -- like zirconium dioxide for implants. The country starting educating people to become dentists in 1942. This is when the University of Costa Rica opened its School of Dentistry. Costa Rica is a country that prioritizes providing dental care to its citizens. People who live in Costa Rica can purchase private insurance plans which are bought through INS. These are government-owned insurance companies. These plans cost between $60-$130 per person. All of these plans include dental work -- so procedures are covered. In the United States, dentists have an undergraduate degree, as well as four years of dental school under their belt. There are a wide range of dental schools that aspiring dentists can attend to receive their degree. Once they finish their first four years, students that want to specialize in a particular kind of dentistry must also take a few more years of school. Depending on what they want to be an expert in. Dental training in Costa Rica is a bit different from that in the United States. There are four main dental schools in the country, and together, they churn out most of the countries' dental care practitioners. In order to become a dentist in Costa Rica, most students spend six years in dental school. Then, they must also spend an additional two to three years if they want to specialize in an aspect of dentistry. Experts on dentistry in Costa Rica say that one of the main differences between training in the United States and Costa Rica is that United States students can get their hands on the newest dental technology more quickly. On the other hand, Costa Rican dental students graduate with much more clinical practice on actual patients. They're well prepared to step into a real medical office and start treating patients. How Much Do Costa Rican Dentists Earn? In Costa Rica, a dentist earns, on average, $42,169 per year. That is much lower than the pay for dentists in the United States, where dentists earn an average annual salary of $172,350. Because the Costa Rican economy allows dentists to be paid a lower wage, tourists to Costa Rica can enjoy more affordable dental care when they travel there. How Do Dental Costs Compare With the United States and Other Western Hemisphere Countries? Clearly, the wages of dentists in Costa Rica are much lower than those in the United States. Similarly, the cost of dental work in Costa Rica is significantly lower than the cost of dental work in the United States. For example, a dental crown costs $1,200 in the United States, and $350 in Costa Rica. A root canal in Costa Rica costs $750 -- while it will set you back $2,200 in the United States. U.S. dental implants cost $3,900, while Costa Rican ones cost $1,600. Finally, while dentures cost $1,800 on average in the United States, they only cost $525 in Costa Rica. Because the country is focused on dental care, the dental health statistics in Costa Rica are relatively impressive. For example, there prevalence of cavities in preschool age kids in Costa Rica is only 43.7 percent. That is lower than the prevalence in children of the same age in the United States. People come to Costa Rica from abroad to enjoy the beaches, mountains and rainforests. They also come to have their teeth worked on, and dental tourism is a big industry in the country. People come to Costa Rica for dental care because the care is usually cheaper than what they can find in their own country. Dental tourists come from a range of countries, including the United States. In fact, because nearly 120 million Americans don't have dental insurance, many people choose to seek treatment in Costa Rica. 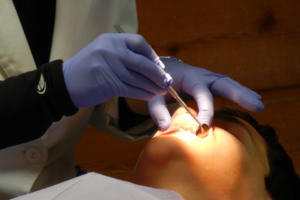 One of the leading destinations for dental work in Costa Rica is called the Flikier Institute of Dental Rehabilitation. It is located in San Jose. This dentistry provider offers odontological care -- and serves about 50 percent of all medical tourists that come to Costa Rica. There is also a popular destination called the Meza Clinic. This is an American-accredited clinic that is headed by a dentist who was trained at UCLA's dental school. There are several reasons that people choose to come to Costa Rica for dental care. First, the cost is lower, and you don't need comprehensive dental insurance to receive treatments. Next, most Costa Rican students study abroad in places like Canada, Australia, England and the United States. For that reason, many are bilingual, and they can offer excellent services to English-speaking patients. Logan Harper is digital strategist with DentalSave, the original discount dental plan. He studied International Affairs at The George Washington University and resides in New York City.